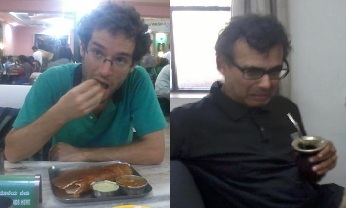 Miguel, a postdoc at the Raman Research Institute (RRI), enjoying a traditional south Indian dish: masala dosa. Madhavan (professor at RRI) not enjoying traditional South American drink: mate. It is of great physical interest to construct a canonical quantization of asymptotically flat spacetimes. The classical phase space variables are subject to delicate boundary conditions at spatial infinity and the first challenge is to construct a quantum kinematics which carries an imprint of these boundary conditions. This work is one of a series of papers which seeks to construct such a quantum kinematics based on a recent generalization of Loop Quantum Gravity (LQG). While LQG exhibits a microscopically discrete (and degenerate) spatial geometry, this generalization by Koslowski and Sahlmann (KS) allows for non-degenerate quantum spatial metrics. Since asymptotically flat spatial triads approach a non-degenerate flat metric at infinity, the KS representation is ideally suited to address the spatial metric boundary condition. asymptotically flat spatially non-compact case . demonstrate the success of our strategy. While the quantum spatial geometry satisfies the exact classical asymptotic conditions, elements of the quantum configuration space satisfy a slightly weakened version of the classical asymptotic conditions. generated by the diffeomorphism constraint. This allows us to construct spatially diffeomorphism invariant states which support a unitary representation of the transformations generated by the total spatial and angular momenta at infinity thus exhibiting the desired features of a satisfactory kinematics. As in the spatially compact space the quantum dynamics remains a key open issue which we hope to tackle using the kinematics we have developed. M. Campiglia and M. Varadarajan “The Koslowski-Sahlmann representation: Asymptotically flat kinematics”, in progress. This entry was posted in Author Insights, IOPselect and tagged Loop Quantum Gravity by Adam Day. Bookmark the permalink.